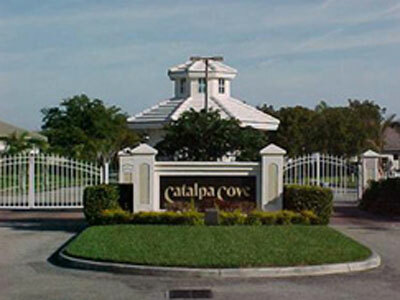 Catalpa Cove is an upscale, gated boating community located on the shores of the Caloosahatchee River in South Fort Myers, just minutes from the Gulf. The beautifully landscaped community offers 79 single-family homes ranging in size from 2,800 to over 5,000 square feet and all homes include a dedicated boat dock situated on a deep-water access canal. Catalpa Cove residents enjoy a wide assortment of amenities including over 1,800 feet of lighted docks; a playground and barbeque area; and tennis courts. Catalpa Cove is just a short boat ride to Sanibel Island and area beaches.